As familiar as you might be with your car, when can you say you last gave any thought to your headlights? After all, you probably take great pride in your car's paint job or maybe even the interior, but your headlights you have probably never given a thought to, that is until one goes out or the highway patrol inspects them and finds one out of kilter. The truth is that according to several studies, without proper attention paid to your headlights, you could be losing up to 80 percent of your brightness, which is not a cosmetic issue. It's a safety issue. At first glance, most people consider their headlights to be beyond help. Headlights are, after all, glass or glass covered with a plastic cover and out there for everything to make a pit into. And when you take a closer look, you will probably see scratches and pits galore. And much of this is beyond the help of any do it yourself kit. Right? Not really. The truth is that there probably isn't a headlight anywhere that can't be helped, even to a great extent by some kind of treatment. And there are many out there that come under a variety of names and are used in different ways. There is the 3M headlight lens restoration system 29008, Sylvania headlight restoration kit, 3M 39008 headlight lens restoration system which comes with a good 3m headlight restoration kit instructions and others. All of these kits involve some kind of combination of ingredients that not only remove pits and other imperfections in the surface of the headline, but they also include some kind of polish to bring out the luster in the surface. Most of these kits are pretty good, but if you don't want to spend the money or for whatever other reason you want to try a headlight restoration home remedy, a good alternative is to clean your headlights with toothpaste. Just use the toothbrush of your significant other since it usually works better than your own. And no, we don't recommend divorce attorneys to our clients. There are a lot of headlight restoration kits on the market, all of them working pretty well. The best way to determine which is best for you is by checking the headlight restoration reviews to see which is best for you. 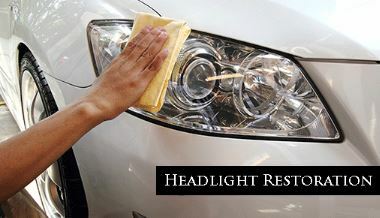 Headlight restoration diy is also always a good option, but some people simply don't want to get their hands dirty. Finally, you can always use a headlight restoration service such as that which you get with a detailing job from Elkhart Auto Detailing. In fact, why not call them today to see how much time you can save by avoiding all the hassle associated with headlight restoration and letting a professional give you the best job to start with. Elkhart Auto Detailing specializes in everything having to do with detailing, so they have to do it better, which includes headlight restoration. Call them. They're good. You won't regret putting your car in the hands of a pro.